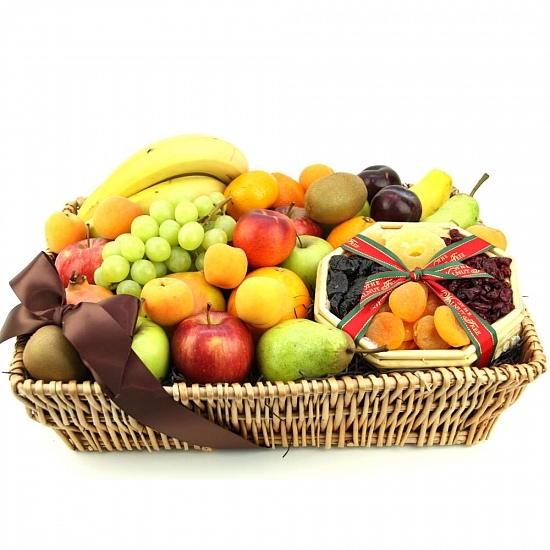 Fulfill the desire of natural fruity flavors of your loved ones with this Wishful Delights Fruit Basket. The basket is a complete package full of fresh and vivacious collection of fruits of assorted in a beautiful cane basket with silky ribbon. The fresh and juicy fruits are not enough but a small pack of dry fruits also ornament the fruit basket with its dazzling taste. Send this lavish fruits basket by post to UK for any grand occasion like Christmas, Wedding, Anniversary, Thanksgiving, or Congratulations with your personal message card attached.